1 Peel the onions and cut into 5 mm (approximately 1/4 inch) thick rings. Peel and crush the garlic cloves. Rinse the pears, cut into quarters and remove the cores. Cut pear quarters in half. 2 Put onion rings, garlic and pear pieces in a roasting pan and season with salt, pepper and sugar. Drizzle with 1 tablespoon oil. Bake in preheated oven at 200°C (fan oven 180°C, gas mark 3) (approximatey 400°F/convection 350°F) for about 10 minutes. 3 Rinse marjoram, shake dry, pluck leaves and finely chop. Crumble Roquefort and mix with marjoram. 4 Cut a horizontal slit into each veal chop to form a pouch and fill it with the cheese; seal the incision with 2 wooden skewers. Season meat with salt and pepper. 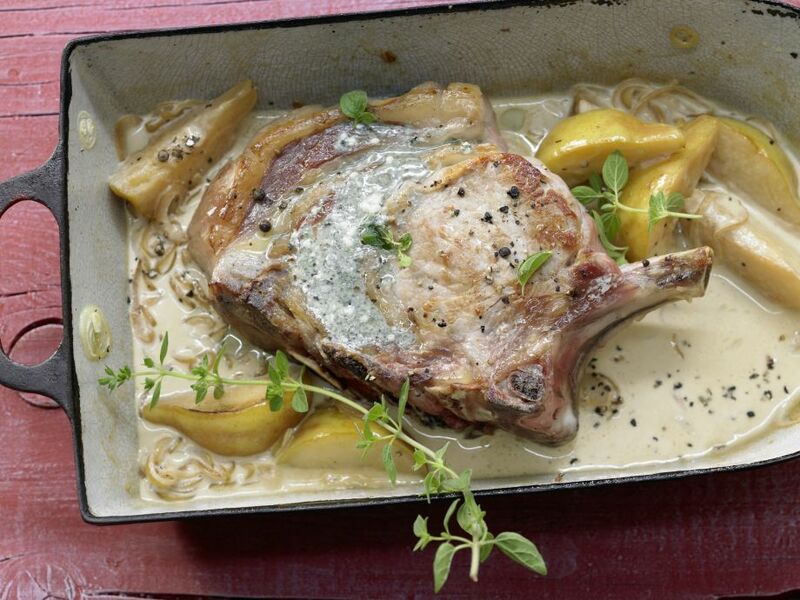 6 Remove the veal chops, wrap in aluminum foil and let rest for 5 minutes. 7 Place the roasting pan on the stove and bring the liquid to a boil. Deglaze the pan with white wine, scraping up browned bits from bottom of pan, and let simmer until completely evaporated. 8 Add the soy creamer and let it boil over medium heat until thickened, 3-4 minutes. Squeeze juice from half a lemon, then whisk 2 teaspoons juice into sauce and season with salt and pepper.